First off, think of the adjectives that characterize the unique beauty and appeal of this scarf. To me, this scarf is clear, graphic, and linear. This gives you a basis upon which to think about the sort of outfits that might benefit from the addition of this scarf. And secondly, I like to always think of, and refer to, scarves as silk jewelry. So it makes some sense to look at some pieces of jewelry that reflect the same overall aesthetic that the scarf has. Then you could make the mental translation that if you would wear certain jewelry with an outfit, the scarf also might be a harmonious choice. These pieces of jewelry are starkly black and white, but with textural or woven interest, and a sense of modernity and clarity. For me, the obvious way to expand on black and white graphics is the addition of a solid, clear, bright, saturated color – red is the classic choice. But clear bright blue is also beautiful with black and white. Notice the woven wristlet, and the woven ornament on the lapis earrings – all these little touches keep things harmonious and help define your personal style a bit more clearly. And warm colors, so long as they are clear and bright, work beautifully – although the striped skirt with the patterned scarf is for the bolder among us! And the scarf itself has nothing about it which limits it to any season of the year, so this idea is as valid with a pair of shorts as it is with a suede skirt. It’s an interesting wardrobe – not what you usually see, but certainly workable and lovely! I have two other black and white scarves that have been suggested as subjects for some wardrobe thought. They are in gradually more subtle patterns, and I’m eager to see how my selections for wearing them will change as the nature of the scarf shifts. That's interesting! The many colours in the one wardrobe certainly appeals. Your comment about the striped skirt with the patterened scarf being for the bolder amongst us reminds me that I have been meaning to ask you to do a short tutorial on mixing patterns. When I see this in your set, it doesn't look so way-out to me (notwithstanding your caveat). The same goes for mixing the striped top with this scarf, as in your first picture. But neither of those is something I would have thought of myself – I really struggle with how to mix patterns. Also, could you sometime do a similar post about mixing shades of the same colour? I recall that you wrote in one of last year's posts that colours don't have to match exactly, but how do you know when it is an acceptable stylistic mixing and when does it look as if you just failed to get the dyes to match? I am enjoying the blog and learning a lot; but some things still baffle me……. I remember reading that too, but I cannot find it. I know there were some posts on wearing floral and paisley jeans a while back. I also would appreciate more information about color mixing and matching. I read about color theory and tones, values, and saturation, but have trouble choosing a sweater that will work with my top. I did locate the following discussion about dye lots. Hello!! I am fairly new to your site (which I absolutely adore BTW) and did have a question about "dye lots" I've decided to embrace your approach and am in the process of weeding out and refining my wardrobe using black as one of my core 8 basics. When putting together say a twin set and black pants (as pieces of the basic 8 group) if they are slightly different shades of black does it still work to wear them together?? Posts like these make me realize how much I've learned, not only about styling and wardrobing, but about myself and who I am sartorially. When I saw this post, I fell in love — with the colors, the simple lines, everything. Then I realized that I don't really feel comfortable wearing colors this bright and I prefer patterns or textures to solids. That helps me take what I love about these outfits and apply it to fabrics that are more in my comfort zone. Reading the logic behind the choices is SO helpful! Thank you thank you thank you!!! Very fun pieces to showcase the scarf. The scarf design is so different from my concept of Hermes, that I went to their site to see how it looked tied. Normally the designs extend to the edge. There would be no decisions on which corners to showcase with this scarf. The cobalt blue and lime green are my favorite color combos. And love the attention to detail you included. Swap out the black for navy, and this looks like my wardrobe. I'm trying to narrow down my accent colors, but I love bright colors. I always enjoy studying posts, but the days you give the most explanations for your choices are the most enlightening. I still struggle to make good color choices and have found that working with a scarf assists me in choosing harmonious colors. Your defining descriptions such as those below are intriguing and give me another aspect to ponder. • warm, saturated, and clear, with unexpected bursts of bright against the toasty neutral. Thank you for the time and thought that goes into your teaching. I'd wear that with pretty much anything •but• black and white! And mix it with a bright paisley. I usually go for the more colourful Hermès scarves- they have such intriguing combinations-so would take a lot of discipline to choose this rather stark black and white. Love it, though. Gorgeous! I love bright saturated colors. Thank you for picking this particular scarf, as I look at their website and think I wouldn't have any idea how to pair half of their scarf designs with an outfit – very informative! I also think that a wardrobe works best when its essence is compatible with either the wearers personality/energy level and their physical characteristics. Therefore, while I appreciate this wardrobe objectively, it does need to be worn by a woman with clear skin, bright hair and perhaps a sleek figure. Otherwise, the wardrobe will dominate not have integrity or harmony with the person. I notice most of the tops have some ease and are therefore quite kind to those of us not sleek. I agree that good grooming elevates any ensemble and creates that harmony. 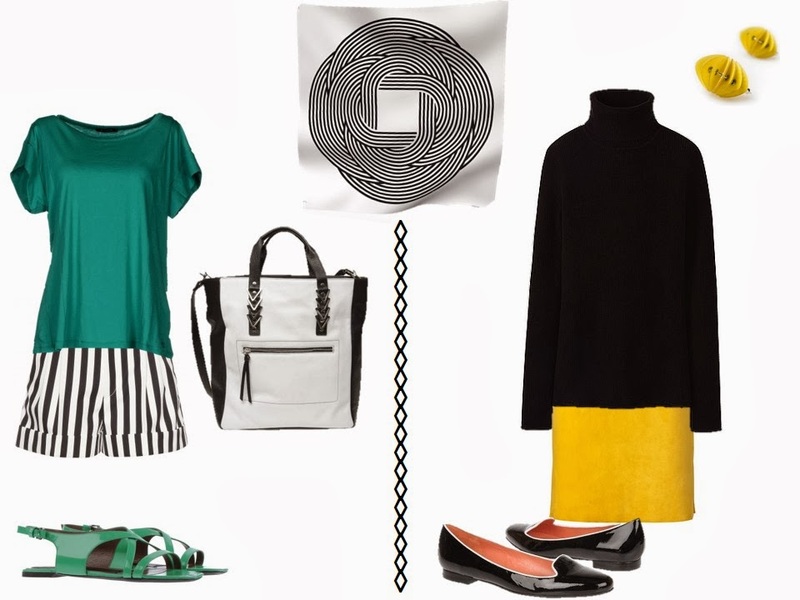 At the same time- in my most disheveled days, staggering with fatigue-having something to wear like that black sweater/yellow skirt would have made me feel pretty and lent energy. Sometimes clothes lift you, and sometimes you lift them. What a creative way to think about scarves, this will be so interesting to explore. Thanks! As I was logging in to your blog a few minutes ago, I was thinking about a black and white Hermes scarf I own and for a brief second thought about asking you for some ideas, but there they were! Voila! Today's presentation is exquisite. It speaks to my love of color and lifelong "go to" colors, black and white. My mother was horrified that her eight year old daughter wanted wear black. How times have changed in that respect. I am so happy to have found your delightful site. I'm wondering, would you consider working in the occasional hat? I would love to see your take on that. Also, I would like to see photos of how some of these wardrobes look on a model, a realistically sized one, please! LOVE that scarf! I've been thinking of investing in a black and white scarf to pattern mix with a black and white check skirt and now I think I should take the plunge (it's only 20 pounds, but I'm not used to spending much money on accessories.). Red was the first thing I thought of when I saw your black and white scarf, by the way. I've been noticing a distinct lack of black and white scarves in my wardrobe lately (like…NONE!). Must rectify! I saw thia scarf as the display item (you know, the one they mount in a backlit frame) in the Hermes shop at the airport on Friday – only in a sort of fuschia on a black background! Also stunning!